The African crested rat (Lophiomys imhausi) looks like a cross between a guinea pig and a skunk (Figure 1). 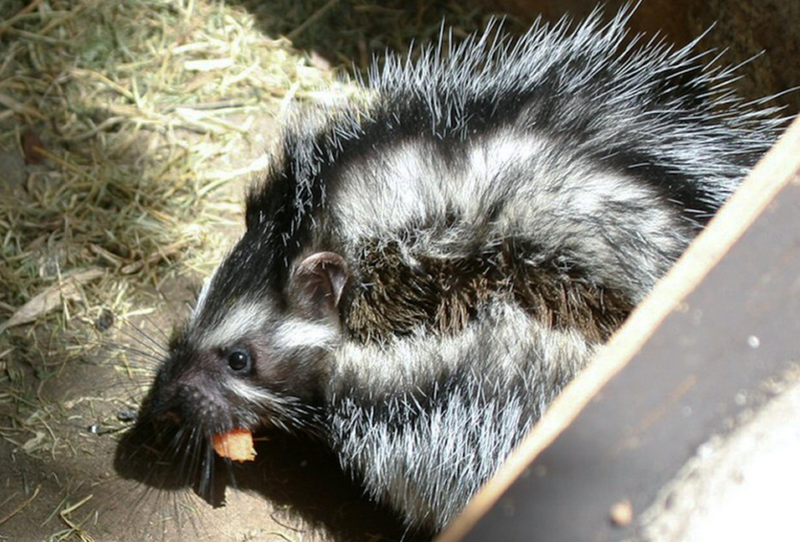 They have long, shaggy black and white fur, leading some mammalogists to speculate that they are mimicking skunk-like zorillas (Ictonyx striatus), and thereby deterring predation. The truth is far more interesting. It turns out that African crested rats are poisonous rather than non-toxic mimics. Anecdotal reports of dogs being poisoned by crested rats are known from areas in Kenya where these rats are endemic. However, just how these rats might inflict a wound or manufacture poisonous compounds was a mystery. Enter Jonathan Kingdon and his colleagues (2011) who closely examined the hair morphology and behavior of these strange animals. Their findings indicate that these rats have specialized hairs growing in two lateral lines along the body (Figure 2). These hairs are perforated by numerous holes and are exposed when the animal is disturbed. The function of these perforations was revealed when crested rats were observed feeding on bark of the Acokanthera tree. Instead of eating the bark, they masticated it and applied it to their specialized fur. In parts of East Africa, indigenous hunters have used the bark and roots of Acokanthera trees to create poison for the tips of their arrows (even for elephant hunts). Later, bark extracts were shown to contain ouabain a cardiac glycoside. By applying this toxin to the fur and allowing it to be wicked up into the vacuoles in the specialized hairs, the African crested rats were self-anointing with a potent poison (Figure 3). Spectroscopy of the masticated slurry and the contents of the hairs revealed that ouabain was indeed present inside the hairs. Evidently, exposure of ouabain in the mouth of the rat does not cause it any harm, but the role the rat’s salivary glands play in this immunity is unknown. The self-anointing of toxic compounds serves as a predator deterrence and enhances survival ‘managing’ the bites of a predator. This is the only example in placental mammals of potentially lethal toxicity produced by self-anointing.